"It's the hubris of every generation to think that they have arrived at the best way of living. But all the things we now take for granted, all the modern wisdoms we hold to be self-evident, were once derided as dangerous or foolish radical thinking." Seven groups are on the target list, with a chapter dedicated to each; transhumanists, European nationalists, a psychedelic society, an Italian Internet-based political party, a functioning free-love commune, a collection of climate change activists, and a tiny new country founded on Libertarian principles. Bartlett embeds himself with these groups and approaches each with a commendable balance of genuine open-mindedness and healthy skepticism. He’s the kind of writer that can sift through complexities to find value in supposedly absurd or dismissed ideas, be highly critical while avoiding cynicism, and also be skeptical of skeptics themselves. A merchant of information, Bartlett offers readers a great deal within these pages. If knowledge is what you’re after, you won’t be disappointed. Each organization is outlined, infiltrated, dissected, and reviewed. Background and applicable history, multiple points of view, pros and cons are all presented. Bartlett’s writing is smooth and authoritative with a noticeably friendly tone. He doesn’t miss a beat, keeps you constantly interested, and even allows for the occasional good laugh. When subject matter gets complicated, the author thankfully doesn’t, breaking down and filtering the material so readers can digest it more easily. It would be easy to dismiss these radicals if they didn’t seem to constantly be on the cusp of what humanity potentially faces. What is it they know, or think they know, that the rest of us don’t? The answers may be surprising and the supporting data equally alarming. In a world where popular ideas are becoming more insular, radicals are the ones thinking outside the box. What’s more, they could very well be our best hope for the future. Most of us have been asleep at the wheel too long, lured into a false sense of security in a world that has the increasing potential to be turned on its head at any time. The radicals among us sense imminent danger and impending doom. The mainstream may not have the answers, so it’s society’s outsiders who try for more abstract solutions and do so on their own terms. 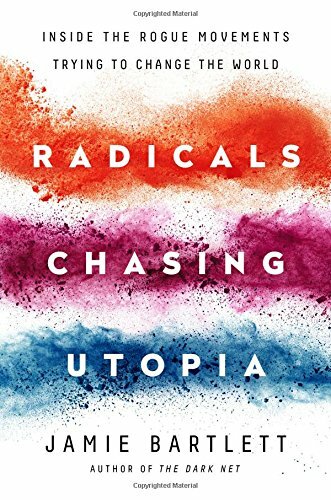 A highly recommended read, Radicals Chasing Utopia could influence you to chase after some of these utopian organizations and ideas, or make you want to flee from them just the same.